Hailed as “the guide to capitalism,” the New York Times bestseller Wealth and Poverty by George F. Gilder is one of the most famous economic books of all time and has sold more than one million copies since its first release. In this influential classic, Gilder explains and makes the case for supply-side economics, proves the moral superiority of free-market capitalism, and shows why supply-side economics are more effective at decreasing poverty than government-regulated markets. Now, in this new and completely updated edition of Wealth and Poverty, Gilder compares America’s current economic challenges with her past economic problems–particularly those of the late 1970s–and explains why Obama’s big-government, redistributive policies are doing more harm than good for the poor. Making the case that supply-side economics and free market policies are–and always will be–the answer to decreasing America’s poverty rate and increasing her prosperity, Wealth & Poverty offers solutions to America’s current economic problems and hope to those who fear that our best days are behind us. George Gilder is a New York Times bestselling author, journalist, and preeminent economic thinker. Presently, Gilder is also the Editor in Chief of Gilder Technology Report, Chairman of Gilder Publishing, LLC, and a Senior Fellow at Discovery Institute. Born in 1939 in New York City, Mr. Gilder attended Exeter Academy and Harvard University. At Harvard, he studied under Henry Kissinger and helped found Advance, a journal of political thought. Gilder later became a fellow at Harvard University’s Institute of Politics and editor of the Ripon Forum. In the 1960s, he served as a speechwriter for several prominent officials and candidates, including Nelson Rockefeller, George Romney, and Richard Nixon. 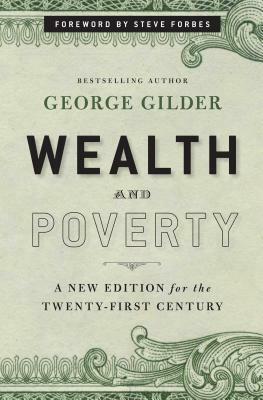 In the subsequent decade, as an independent researcher and writer, Mr. Gilder began an excursion into the causes of poverty, which resulted in his original publication of Wealth and Poverty (1981). Gilder pioneered the formulation of supply-side economics while serving as Chairman of the Lehrman Institute’s Economic Roundtable and Program Director for the Manhattan Institute, and contributing to Art Laffer’s economic reports and the Wall Street Journal editorial page. His work laid the foundation for Reagan’s economic revolution. Thanks to the success of Wealth and Poverty, Gilder became the most frequently quoted living author by President Reagan. In 1986, President Reagan awarded him the White House Award for Entrepreneurial Excellence. Mr. Gilder is a contributing editor of Forbes magazine and a frequent writer for the Economist, the American Spectator, the Harvard Business Review, the Wall Street Journal, and other publications. He resides in Massachusetts with his wife and four children, where he is an active churchman and avid runner.